I feel like January is a month where we're all trying to making healthy choices, yet we still want those comforting meals to get us through the dark, cold Winter days. Pizza is the biggest comfort meal to me and one I could never tire of! Generally pizza isn't the healthiest of food choices, but that's about the change with this incredible Free-From Pesto Pizza recipe! 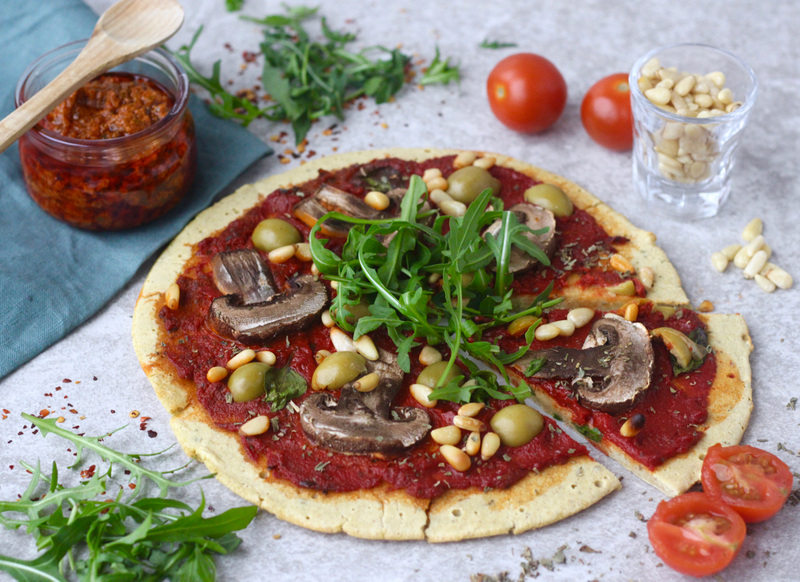 The base for this pizza is made using chickpea flour combined with a little buckwheat flour for a naturally gluten free alternative, it's also light yet wonderfully filling as well as being high protein and suitable for vegans. 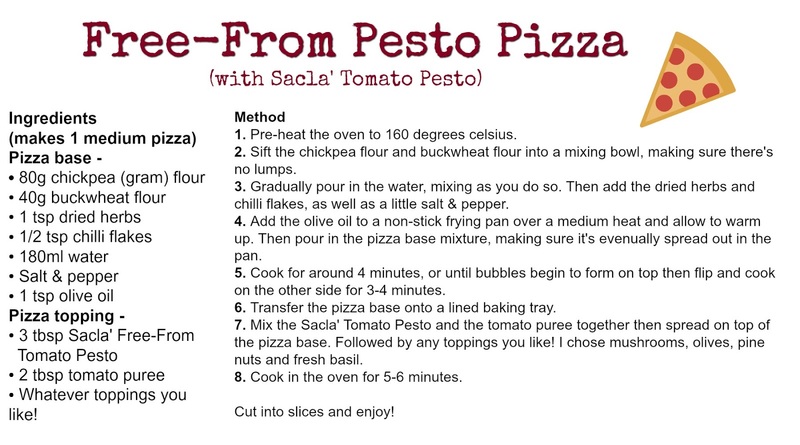 To give this pizza an extra little bit of something special I used Sacla' Free From Tomato Pesto as the base topping which adds such a wealth of flavour and richness to this recipe. 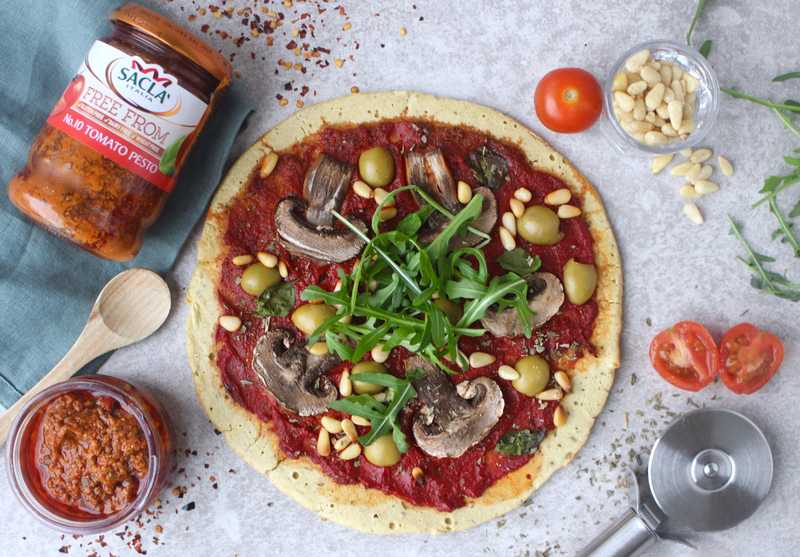 The Sacla' Free From Tomato Pesto is free from both gluten and dairy, as well as containing no refined sugars but with no comprise on taste! Instead of cheese tofu is used to give that same great taste and texture, as well as added plant-based protein and calcium. Of course this pesto is wonderfully more-ish stirred into pasta, and I also like cooking lots of veggies in it (try it!) but spreading it onto this pizza base is a total game changer! The juiciness, rich basil and pine nut flavour work so well on pizza and make a change to the standard tomato base. Sacla' Free-From Pesto (also available in the Basil flavour) are a real staple for my cupboard. They can be found in most supermarket free-from aisles or you can purchase them online here. The chickpea flour pizza base itself couldn't be simpler to make either! I know a lot of free from pizza base recipes require loads of ingredients, tons of preparation and hundreds of steps but this quick recipe shouldn't take any longer than 15 minutes to make! It's a winner.